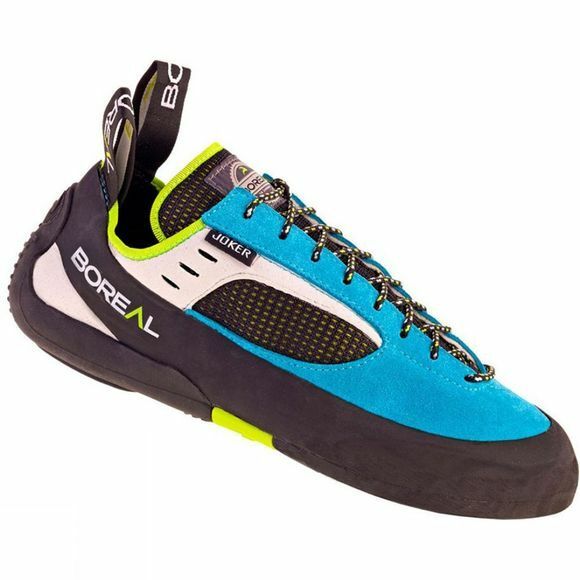 The Women's Joker Lace Shoe from Boreal is a great option for all day training sessions and long routes. It has been designed to offer great comfort for those just starting out while still being able to handle technical advances. Also a great option for veteran climbers who are looking for a more relaxed alternative. A cushioned heel system ensures cushioning against the hard rocky ground and offers a softer landing when stepping off problems, in addition to this an integrated rand system is created with one piece of rubber that won't deform over time to ensure a consistently great fit. The Zenith Quattro rubber from Boreal is ultra sticky for a reliable grip on tentative holds while the split leather and microfibre upper wraps around your foot providing comfort and support.